This post highlights the fourth of four social media strategies I uncovered in my experiment to learn how companies use this medium to engage their customers. I highlighted the first two strategies, the Placeholder and the Sell and Tell, last week. Yesterday, I highlighted the Forum. Today's strategy is called "Engage", as in "I'm using social media to engage my customers". The funny thing is very few companies in my experiment used this strategy. 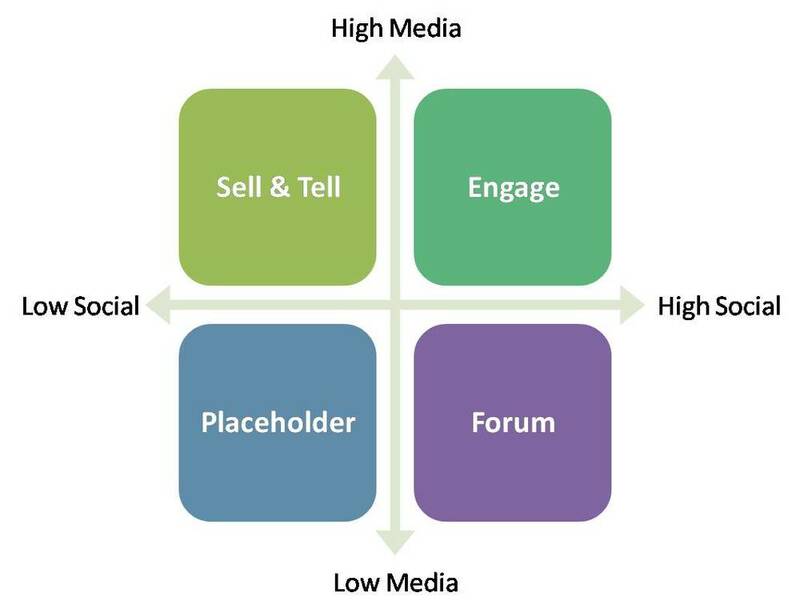 This strategy is characterized by high levels of social interaction and high media. The catch is your media piece has to be interesting to your customers to entice them to socialize with your company. This strategy isn't right for every company because it can take a lot of time and effort, but there are a few situations where it can be tremendous. Your products or services require some education. The Cuvaison winery is a great example here. They post YouTube videos of their latest wine releases to their Facebook page. If you are a wine club member, you can watch the short video and then wait for your latest shipment to arrive a couple days later. Comment on how you liked it and someone from the winery will reply! Your brand truly inspires passion, and your customers want to interact with your company and with each other. Unfortunately, I didn't find any good examples here, even though I consider(ed?) myself a fan of these organizations. Respond! You risk alientating customers if you don't respond to comments or participate in conversations, especially the conversations you initiate! Provide meaningful media. Give us something interesting to start the conversation. The Home Depot recently posted a video to their Facebook page that explained how to start a container garden and then asked, "What's the most unusual container you've used as part of a container garden?" They got some interesting responses and I found it helpful because it's something I'm looking into. Tune in tomorrow for the exciting conclusion. One preview - 7 of the 12 companies in my experiment hurt their image in my eyes. Tomorrow I'll reveal all and tell you why I think a lot of companies have a long way to go.